This famous Scottish surname recorded in the spellings of Abercrombie, Abercromby, Abercrumby, and others, has supplied several branches of the Scottish aristocracy. 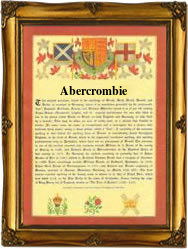 It is locational and originates from the barony of Abercrombie in Fifeshire. The first known name holder (see below) is recorded in various spellings including Abercromby and Ab'crumbi. He was a prominent citizen and is recorded in a number of wills and land charters, as well as the court register of Fifeshire where he was a juror on several occasions. Johan de Abercromby rendered homage in the same year, (1296), and it is believed he was William's brother. It seems that the original Abercromby chieftains of the clan, known as 'Abercromby and all that Ilk', became exinct in the 17th century, the chieftainage passing to the Abercromby's of Birkenbog. There are believed to be at least eighteen recorded spelling forms including the French 'Abrecommier' and Abyrcrummy. Many of the nameholders were Roman Catholic and for several centuries upton 1792 were officers in the regiment of the Scots Guards in the army of France. The coat of arms has the blazon of a silver field, a fess embattled between in base a red chevron indented between three boars heads erased, the crest shows a hand grasping a French republican flag. An American blazon was granted to the Abercromby's of South Carolina in 1778, then still a British colony. The first recorded spelling of the family name is shown to be that of Sir William de Abercromby which was dated 1296. He paid homage to the Scottish Government, during the period known as 'The Interregnum Government', 1296 - 1306.